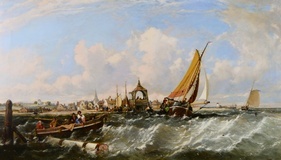 Ebenezer Colls was a marine artist born in Horstead, Norfolk on 1 July 1812 to Richard and Sarah Colls. 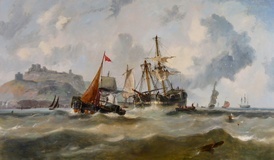 He married Harriet Beal in 1841 in Thanet, Kent with whom he had 5 children. The family lived in the St Pancras area before settling in Hampstead where they lived at 79 King Henry’s Road. 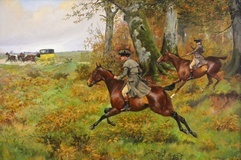 Colls appears to have been independently wealthy and worked as a picture dealer before becoming a professional artist. 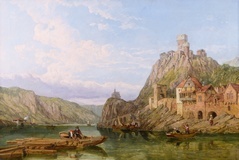 He exhibited at the British Institute from 1852. He died in Hampstead in 1887. 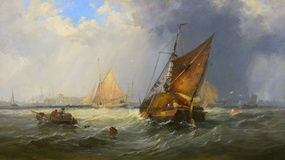 Examples of his work can be found at the National Maritime Museum. 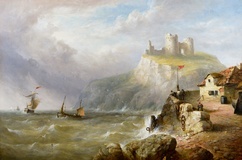 Coll’s paintings show a highly detailed knowledge of the sea and the ships that sailed upon it. 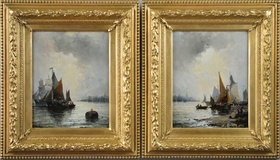 The work is housed in a new British made gilt frame, which is in excellent condition.